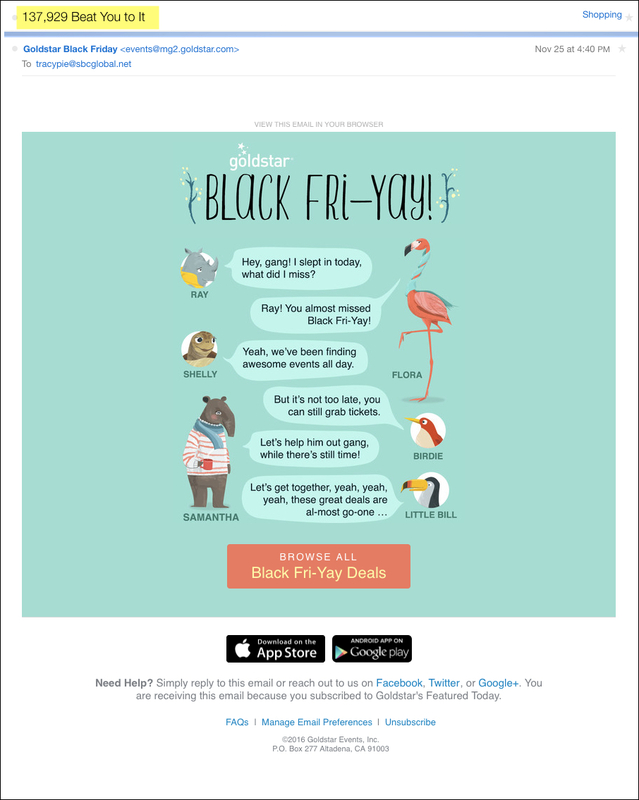 Last year we pointed out some of retail’s best Black Friday email campaigns and there were some really creative ideas. 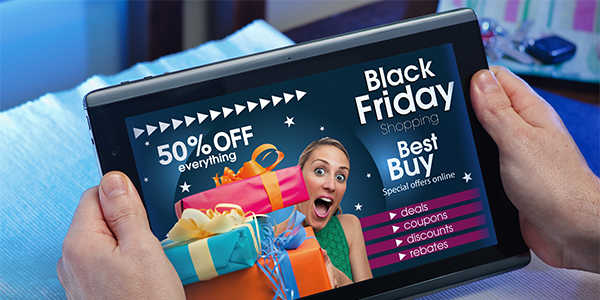 This year, retailers have started as early as November 1st to get customers ready for Black Friday deals. 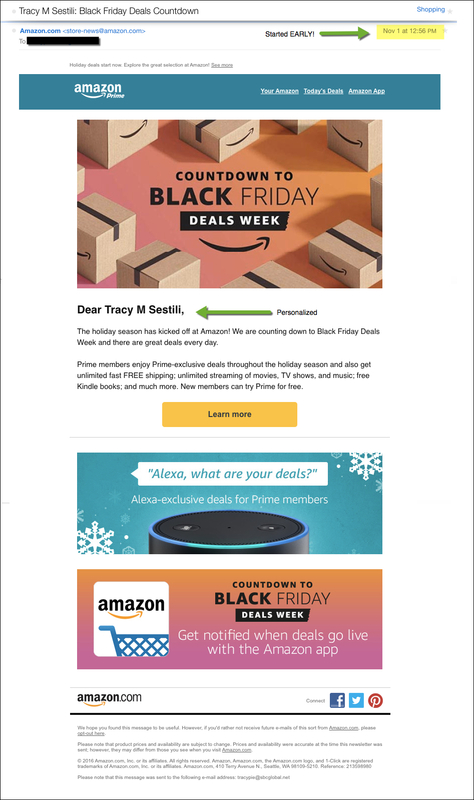 Amazon, for example, sent out a countdown email to Black Friday deals. 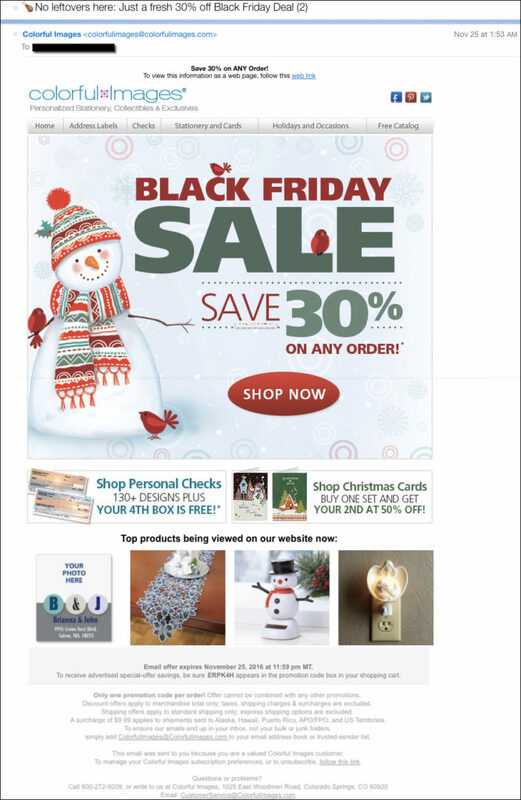 While the email didn’t have a lot of deals in it, it was personalized and it prompted you to download their mobile app so you could see upcoming deals. Plus it did a great job of tying in their other products showcasing Amazon Prime benefits and Amazon Echo features (Alexa app). Through hundreds of retailers trying to grab our attention in our inbox, in addition to starting early, here were some other email campaigns that jumped out at us that we thought were stellar. Colorful Images – No leftovers here: Just a fresh 30% off Black Friday Deal(2) had one of the best use of emojis. We saw a lot of emojis in the subject lines, most were a gift box or a party hat symbol. But this one stood out because it was unique, relevant, and a decent offer. Goldstar Events piqued our curiosity with their subject line. Avoiding the email inbox clutter, they sent it toward the end of the day and we wondered, just what exactly did 137,929 other people beat us to? 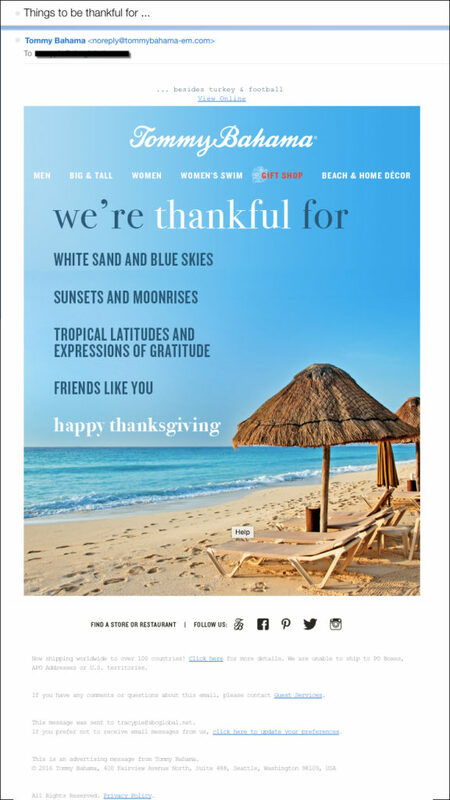 Tommy Bahama took a page out of JetBlue’s email notebook from last year and sent out a non-promotional email (sort of). Then followed up with four separate email offers within 24 hours to try and convert you. Surprisingly, there were too few Small Business Saturday email campaigns. This is something we’d like to see small businesses utilize more since it’s such an easy, cost-effective way of reaching out to their customers. This one from Laundry Locker grabbed our attention because it was simple and to the point, which sometimes is all that’s necessary to break through the noise. Were there any Black Friday or Small Business Saturday emails you received that you thought stood out from the pack? Share them with us in the comments below.